In Alaska's traditional Athabascan cultures, beavers are highly prized for their meat and fur, but just as important, they have a powerful and sensitive spirit. Koyukon Indian elders teach special rules for showing respect toward beavers, to help assure that these esteemed animals will not shun the hunters and trappers. Beaver are very important to native people who live in villages throughout Alaska's boreal forest country. The meat is nutritious and one of the best tasting wild meats. Oils from the castor glands of both males and females are prized for attracting other furbearing animals such as martin, mink, and lynx. And the high quality beaver hides can be sold to fur buyers or used locally for clothing such as mittens, hats, or boots. During pre-contact times, beaver were important to native people as a source of food and furs, but when white trappers and traders came into the country, native cultures began a fundamental change. Starting in the 1800s, white men came to the northern forests of Alaska and Canada lured by the promise of beaver and other furbearing animals. Gwich'in people who live in northeastern Alaska, were traditionally nomadic hunters, fishermen, and gatherers who used ingenious devices to trap or snare furbearers. Then as fur trading became important to their economy and lifestyle, people built cabins along their trap lines and lived in small, scattered family groups. Later as more permanent settlements occurred—offering schools and missionary churches—people's lives became much more focused around villages. Trappers used dog teams, and later on snow machines, to make regular circuits around their traplines. Trapping remains important to many villagers today, as a source of hides and meat, and as a defining part of people's native identity. For Gwich'in Indians and the white traders and trappers who came to live among them, a fascinating story of two intermingling cultures unfolded. The Indians did not see white people as a threat to their livelihood, and so they generously shared their land and resources with them. Living together in the same communities, Gwich'in people and whites intermarried, used the same resources, shared knowledge, and borrowed from each other's cultures. In this way, each group benefitted from the other. The most important season for beaver hunting and trapping comes at the end of the long northern winter, when village meat caches are almost empty. The days are long and bright, temperatures are warming, and there's still enough snow for dog teams or snow machines. This is the easiest and most comfortable time of year for overland travel. It's also the ideal season to look for beavers, but to be successful the trapper must have an encyclopedic knowledge of the land, the weather, the ice and snow conditions, and the intricacies of animal behavior. Koyukon Indians, for example, study their world with the curiosity and intensity of scientists, and they also draw on information passed down through countless generations. People study the life around them, not only because it's critical to their survival, but also because they are constantly engaged, watchful, and fascinated. Knowledge of the behavior of beavers is especially important for trapping. Here is an animal that spends up to eight months of the year inside its house or swimming beneath the ice to forage on underwater plants or eat from the twiggy feed pile gathered during the previous summer. The skilled trapper not only knows the locations of the beaver lodges and dens, but also the approximate number and ages of beavers in each. He won't trap near a lodge where he knows the population is low or dropping. Just as importantly, the trapper knows beaver behavior. For example, beavers build up large piles of sticks and branches in the water near their houses for a dependable winter food supply. An expert trapper has learned exactly where to set traps or snares along the beavers' underwater routes between the lodge and feed pile. 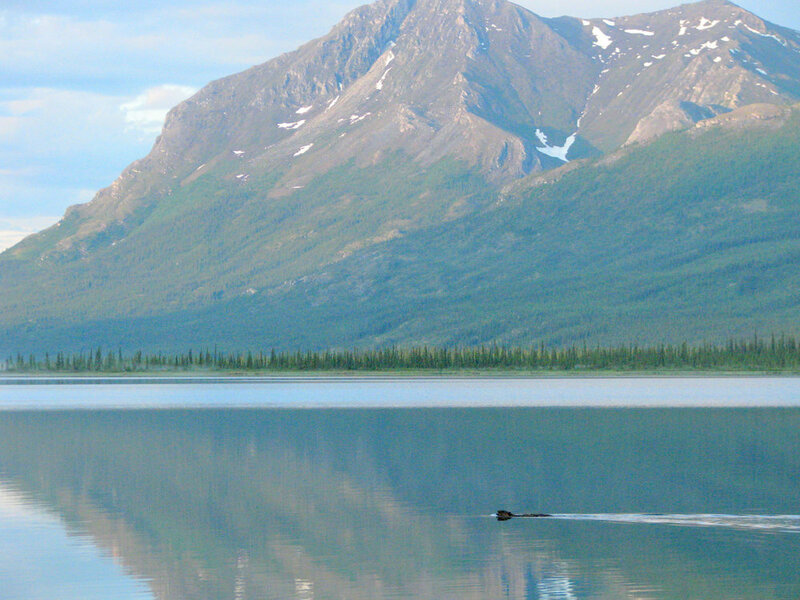 Koyukon hunters travel to lakes where they know there's a beaver lodge. They may not be able to see the lodge because it's buried under several feet of snow, but there's another telltale sign: sticks poking up out of the snow indicating the location of the feed pile. Now the hunter must locate the underwater channels that beaver take to get from the lodge to the food stockpile. There are two ways to do this. The first method is to shovel snow off of the ice between the feed pile and the house, which is visible as a snow-covered mound. After clearing the snow, he carefully examines the surface, looking for the whitish color of air pockets trapped in the ice. These are caused by beavers swimming from their lodge, leaving trails of bubbles that become incorporated into the thickening ice, along with little particles of uneaten bark and twigs. The other way to find beaver channels is by stabbing the surface with a long-handled ice chisel, feeling for any differences in hardness and listening for subtle changes in the sound, a bit like a carpenter tapping a wall, listening for the hollow sound between the wood studs. This method takes years of practice and some very skilled hunters may never master it. Next the trapper cuts a hole through the ice with a chisel or chain saw. Then he may use a long, curved stick to feel the underside of the ice, until he finds an open, tunnel-like arch—the beaver's runway. Once he knows the runway's shape and direction, he can pick the best places to set underwater traps or snares. Some trappers "bait" their snares or traps with fresh branches. During the winter and early spring, beavers are especially attracted to fresh branches, and if the branches are from a kind of tree that's not available in their area, even better. For example, if willows are the mainstay of a beaver's diet, then aspen or poplar would attract keen interest. Finally, the trapper shovels several feet of snow back over the hole, as insulation from the frigid air, so that thick ice doesn't form and make extra work when he comes back a day or two later. Snares and traps are checked frequently, and after a week, success drops sharply…the smarter beavers know to avoid the trap. An expert trapper knows how to catch the biggest animals and then he is wise enough to leave the smaller, younger beavers as seed for the next generation. This is one of the many traditional conservation practices followed by Athabascan Indian people. Alaskan native people like Gwich'in and Koyukon Indians have long savored the nutritious and tasty meat of these animals. It is boiled, oven roasted or cooked on a stick over an open fire. The meat is also excellent dried or smoked and then boiled. Most parts of the beaver are eaten, including the tail, which is mostly fat and considered a delicacy. Beaver are also valuable for the oil secreted from special glands. The castor glands produce a yellowish fluid called castoreum, which the animal uses to scent-mark its territory. Today, castoreum is an ingredient in some perfumes and it is an approved flavoring additive for a wide assortment of sweets, beverages, and desserts. The other gland secretes cream-colored oil that beavers use to keep their fur water resistant. Both are used to attract beavers and other fur animals into traps. Sometimes the bait consists of just the oils from beaver or they can be mixed with other strong smelling bait like rotten fish. Smeared on a bit of moose hide or other substrate, the bait can be irresistible. In traditional native cultures all of nature is imbued with spiritual power. For example, Koyukon elders teach that the grizzly bear has an extremely powerful and demanding spirit. Even saying this animal's name can be dangerous, so it is best to speak of it indirectly as "big animal", or "brown thing." Beavers, though not as powerful as grizzly bears, also have a watchful spirit that must be treated with respect. A Koyukon man, for example, would never boast about his beaver trapping skills or talk in any disrespectful way about these animals. Doing so could result in years of bad luck in catching beaver. And while her husband is trapping beaver, a woman should keep very busy, working like a beaver herself. By doing this, she invites the beaver's spirit to give her husband trapping success. Koyukon elders advise that a beaver's spirit does not leave the body immediately after it dies, so the meat must not be eaten for three days to give the spirit time to leave. When a beaver is brought into the house or cabin, its name should not be spoken. The animal should be skinned that same day, because it is also tabooed to keep an unskinned beaver inside the house overnight. There are also traditions for butchering the animal in a respectful way. A hunter or trapper who disregards rules like these is said to lose his luck, because the offended animals will not give themselves to him. Sharing is a treasured virtue among people like the Koyukon villagers. Of course, this helps to strengthen the bonds among family members and neighbors, but there is also a saying: "What you give away comes back to you." In other words, generosity pleases the watchful spirits in nature, who can give luck to hunters and trappers. Koyukon people have lived in the northern world for many thousands of years, a world that knows both richness and brutal scarcity, and above all, unpredictability. Yet the people have survived here, never depleting the resources the land has offered to them. This reflects the brilliant ways in which they have learned to live on and with the land. Through countless generations of living intimately with the land, people have learned that overharvesting can result in hardship or starvation. From this comes a sophisticated understanding of conservation and the importance of self-restraint. Apprentice hunters and trappers are taught never to take more than what they need, to avoid wasting anything from their harvest, and to be constantly mindful of animal populations—what the numbers are telling them about how well the animal is doing. Knowing this, an expert beaver trapper is careful not to trap near a lodge that has only a small number of inhabitants. In the warm months, the trapper checks beaver ponds and watches the rivers, to get a sense of how many animals are in each area. If the numbers are dropping, he limits his trapping and focuses on richer areas. A man takes pride in knowing that he can trap the same beaver house year after year, because he is careful not to take more than is sustainable. And beyond this, in traditional times, a Koyukon trapper would try to assure his future success by returning the beaver's bones to a lake or river, along with a request: "Be made again in the water." Because he showed them respect in this way, the animals would keep coming back to him. These are some of the ways that indigenous people have lived successfully in the challenging northern world for thousands of years.